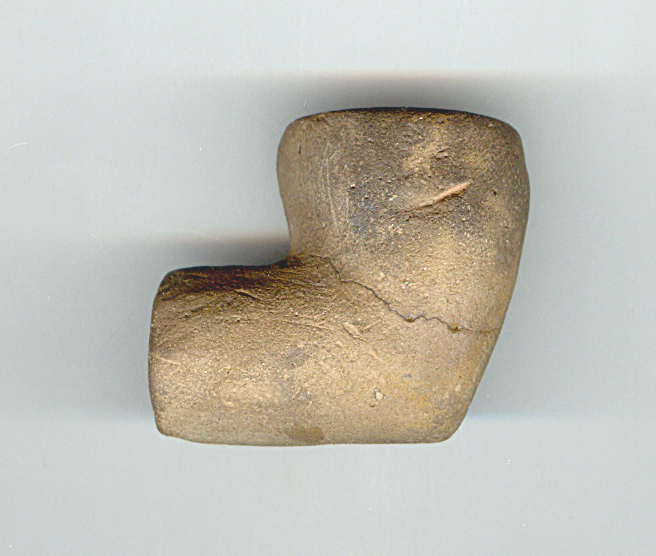 A Small Size, Well Made, Mississippian Elbow Pipe That Exhibits Surface Oxidation And Aging Coloration Patination, Visible Open Pit Firing And Firemarkings, Aged Surface Grog Deterioration Voids, Polished Handle Use Wear, Stem And Bowl Aged Use Wear, Aged Ancient Bowl Smoked Deposits, Correct Style And Shape For The Culture, Correct Material & Manufacture For The Area Found. This Example Has The Bowl Broken And Glued And Has Early Type Sand, Pebble And Some Shell Grog! Includes Jerry Dickey And Ken Partain Certificates Of Authenticity!